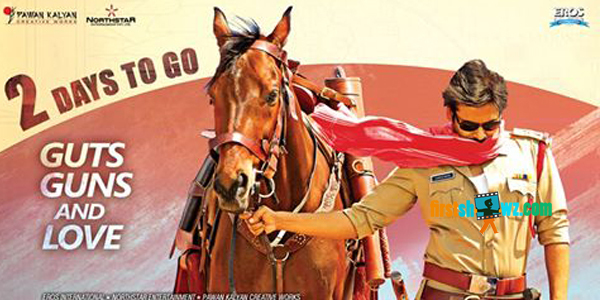 Powerstar Pawan Kalyan's Sardaar Gabbar Singh is heading for a monster opening at the US box-office this weekend. Directed by KS Ravindra (Bobby), the film has been produced by Sharrath Marar under Northstar Entertainment, along with Eros International. iDream Media and Eros International is releasing the film in the overseas markets in as many as 43 countries, including 23 countries where a Telugu film will be releasing for the first time ever. All the premiere shows in the USA are confirmed and prints have already been shipped to theatres. While these prints are going to reach the theatres today, online ticketing has been enabled in all the locations. This is the first time that prints have been shipped and online ticketing has been enabled for a big release of a Telugu film. In USA alone, more than 350 premiere shows have been scheduled on April 7 and already, tickets for 15 premiere shows have been sold out. In several locations, fans of Pawan Kalyan are arranging special shows to celebrate the release of Sardaar Gabbar Singh. That's not all. To cater to the enormous demand for the film, several locations in USA are planning to schedule shows from 4 PM (Eastern Standard Time), which will coincide with the 1 AM shows in several parts of Andhra Pradesh and Telangana. Some of the main locations in the US are going to have 5 to 10 shows on April 7. Just a week ago, when the team of Sardaar Gabbar Singh flew to Switzerland to shoot couple of songs, many people were wondering if the film will even release on April 8; however, in an astonishing turn of events, all the prints of the film have been delivered two days before the release. It's an incredible feat which has surprised both people in the industry as well as the trade circles. While Pawan Kalyan has played the lead role in the film, Kajal Aggarwal will be seen as his romantic interest. Sharad Kelkar has played the main villain, along with a host of other actors including Brahmanandam, Raai Laxmi, Sanjjanna, Mukesh Rishi, Ali, Brahmaji, Suman Shetty, DC Srivastav among many others. Devi Sri Prasad has scored the music and Arthur Wilson is the cinematographer. Get ready for a rollicking time at the theatres with Sardaar Gabbar Singh promising to showcase Powerstar Pawan Kalyan at his best!